The Trans-Pacific Partnership Agreement has not only opened more doors for Vietnam’s footwear industry but also presented more challenges. The year has been tough for Vietnam’s footwear industry with anti-dumping and trade protection policies put up by larger markets, like the US, EU, and Japan, along with a slump in orders. The year 2013 tapped the door with positive news for Vietnamese footwear manufacturers. According to the Vietnam Leather and Footwear Association (Lefaso), until now, many footwear manufacturers have received orders to deliver by the end of second quarter of this year. Orders from the US market will possibly rise by 10 percent, thanks to positive effect of the Trans-Pacific Partnership Agreement while the EU market is expected to be more stable than the previous year, said Diep Thanh Kiet, vice chairman of Lefaso. The agreement is expected to be signed this year and bring many opportunities to export industries in Vietnam, including leather and footwear industry. When the agreement becomes effective, import tariffs imposed on Vietnamese footwear products by the US, which account for 30 percent of total footwear exports of Vietnam, will possibly be cut by half. However, this opportunity is also a challenge for every Vietnamese footwear maker as once the agreement is signed there will be regulations about the rate of domestic raw materials used to produce footwear products in order to be able to enjoy preferential tariffs. Currently, local firms have just made footwear products with 40 percent of domestic-made raw material. According to Nguyen Van Khanh, general secretary of Shoes and Leather Association of Ho Chi Minh City, building domestic-made raw material workshops is not simple as investment capital and outlet of products are thorny problems. Khanh explained that a company that makes raw materials has to suffer losses for at least one or two years and make the material competitive with Chinese products, which are still dominating the market thanks to low prices. There are a few leather raw material producers in the country but they need support from the Government for further development. Moreover, receiving orders is not good news for enterprises as though the value of orders is same as that in 2012, input costs are expected to rise about 30 percent this year, so firms are not sure of profits. 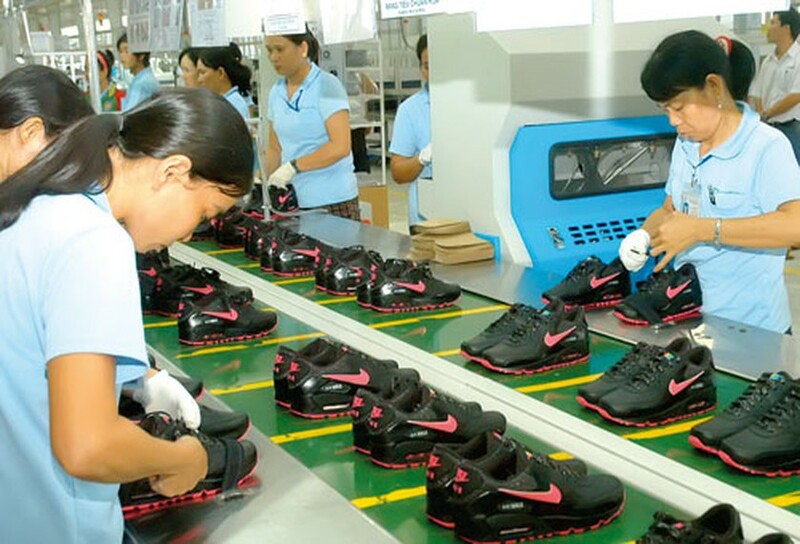 Meanwhile labor productivity is another big problem in Vietnam’s footwear industry. The labor cost in the Vietnam’s footwear industry is equal to that of Indonesia and India, and lower by 25-30 percent than China. However, the labor productivity in Vietnam is 20-30 percent lower than China. In 2012, Vietnam’s footwear industry saw a significant decrease in orders from major markets, including the EU, but the country still reached a turnover of US$8.5 billion last year and set a target of $9.5 billion on exports of footwear and handbags for this year. Vietnamese footwear makers have successfully approached new markets with some of them posting impressive growth compared to 2011 such as Slovakia with 205.34 percent, Denmark with 129.77 percent, and Poland with 121.35 percent. ‘These markets had saved us in the past two years. In the following years, we will continue to seek more new markets in order to lower dependence on traditional markets’, said Nguyen Chinh, representative of Nam An Shoes Company located in Dong Nai Province. Seeking new export markets has been a long-term strategy of footwear industry as well as key export industries of Vietnam. Besides export, in recent years, footwear industry has started to take steps to dominate domestic market. However, a domestic market with a population of 90 million people might entertain illusions for many enterprises. Currently, the industry just has some local footwear producers who gained foothold in home ground, including Vina Giay, Biti’s, and T&T. However, revenues and profits of these companies in 2012 did not only increase but also dropped because of weak purchasing power. Meanwhile, small businesses were not able to compete with Chinese products. Due to expectation of domestic market, some footwear exporters have even built a design team and production line like An Lac Company but until now most companies hardly manage business on both grounds.